Home Parenting	If Mama ain’t happy….NOBODY happy…..
Well that was DEFINITELY the case last night! I walked into the house after band practice and looked for our precious bundle of fur. Normally he sleeps in the bedroom while we are gone but this chilly November night, he came slinking out of the office…which can only mean trouble. I was coming off a busy afternoon/evening and pretty sore and tired as I usually am these days around 8pm (bedtime anyone?) so my patience was already wearing thin. Then I saw it. Thousands, no MILLIONS of feathers. FEATHERS?!?!? What do we have with feathers?? Oh right. Remember my beautiful spare bed? With the pretty fluffy pillows? 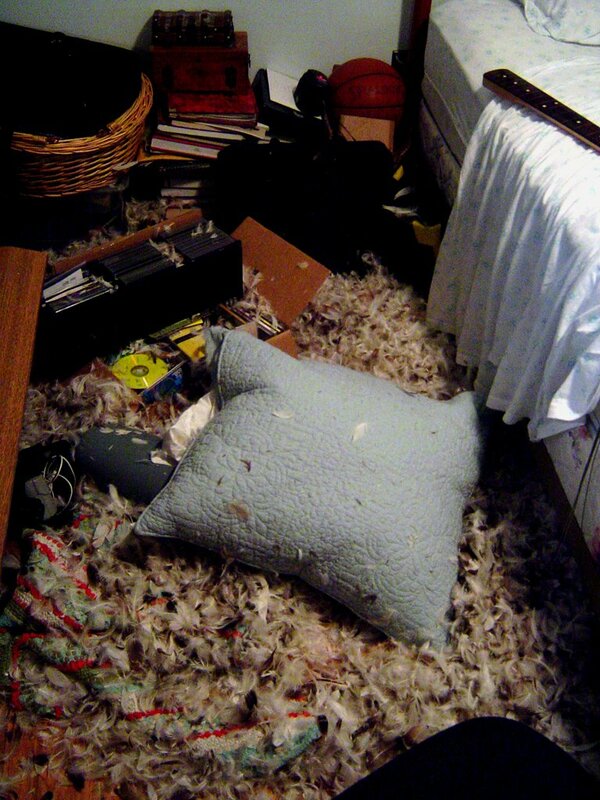 Those pillows have feathers. And I mean, like a whole flocks’ worth. I don’t even know how they got so many feathers into that pillow. AND it still actually looks full! It took me almost an hour to clean it up and it was not easy. The feathers were of course mixed in with other things from the piles in the office (remember I need to organize) so I couldn’t just use the vacuum. I tried to sweep it up but if you are familiar with the nature of feathers, you can imagine how that went. I was back to the vacuum idea when I realized that our regular vac doesn’t have a hose attachment so I opted for the small one. This was a seemingly endless process of vacuum, vacuum, vacuum, jam….change the bag…vacuum, vacuum, vacuum, jam….change the bag…vacuum, vacuum, vacuum, jam….change the bag…Until I filled about 4 bags with feathers. And everytime I would turn to get that one I missed, I would forget that there is air blowing out the back of the vacuum so the room would turn into a winter wonderland for a moment. Looking back, it was quite comical really. And the poor dog. I hate that he does it because he feels bad and tries to come lick my face and make it all better. We did make up but after an afternoon of battling traffic and groceries and traffic and band practice and traffic and making cornbread for work, I was beat. It took 45 minutes to clean the office and once it was done I started getting ready for a bath. I went into the bedroom to get my stuff and noticed that the food bowls were moved. Instinctively I went to fix them and stepped in water. So now I have wet socks – at least I was about to take them off anyway. So another 10 minutes cleaning up the food/water mess. FINALLY, I took my bath and went to bed. Oh yeah, Jerry had another band practice after the one we had for church so that is where he was at this point. His band has a show tonight and they always practice the night before a show. Well I made it to bed. However, at about 1:40am I woke up with the worst neck pain. I don’t think it’s pregnancy related because I have been getting it off and on since one of the many car accidents I endured in my youth. So I am trying to find Tylenol and it has completely vanished. Jerry had the audacity to ask me what time it was at this point and I flipped out in a pregnant rage that ended in sobbing. Good times. I don’t think I slept much the rest of the night and now that I am at work I am really feeling it. I did get my hands on some tylenol from a co-worker but my neck is still sore and I think I feel a cold sore starting on my bottom lip (stress-induced no doubt). Jerry was so sweet this morning. I felt awful for being so mean to him and he was completely understanding and supportive. He said I am doing great and deserve a pregnancy breakdown now and then. Of course that made me teary eyed and even now I feel them coming…. I am glad I haven’t had more nights like this, but when I do it makes me SO sympathetic/empathetic to those moms that I know are having really hard pregnancies. It’s all part of it I guess, but man next time I’d like to skip this part! comical, yes… but i probably would have been about 10 degrees hotter and yelling and crying. i’ve been at it with the vacuum (which spits cat litter at my ankles) and finally this past weekend joe and i went to sears for a new one. we got $143 off the original price due to some big sale that was happening. sorry you are in the emotional trenches. best let out the tears, i say. as for the neck pain… if you have insurance coverage, i really like my chiropractor who has for the most part helped get rid of my neck pain. i’m happy to pick up a card for you next time i go. he’s on the corner of h-boro and glenwood, across from snoopy’s (dr. chad chisholm http://www.chisholmchiro.com). so apparently the bone that frank gave krusty for his birthday wasn’t good enough. ingrate. I probably would have pretended I didn’t see it….